Home Guide What is GPU Scaling and Know How to Enable it? What is GPU Scaling and Know How to Enable it? The best part of gaming is the experience of coming in contact with new worlds and what feels like alternate realities. Bad image resolution and Improper monitor scaling may tamper with your experience and spoil the fun, especially in a USB powered monitor. 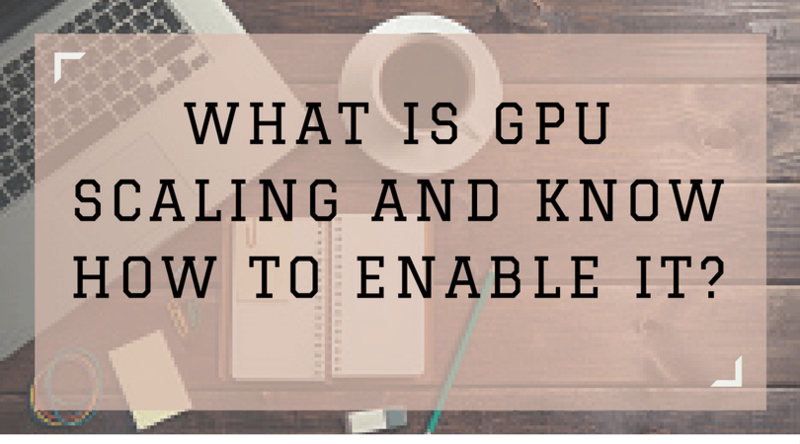 To solve this problem of stretched or blurred images and bad resolution, you can enable GPU scaling in the settings of your AMD graphics card. What does GPU scaling do? What are the different types of GPU scaling? How are they different? How to turn GPU scaling on or off? If you have an AMD graphics card installed, look for the GPU scaling option in settings. Even if you don’t use a graphics card of AMD make, many other graphical processor units also offer the GPU scaling option. A GPU (Graphics Processing Unit) is a processor which works to produce high-quality on-screen images. If you are an ardent fan of video games, you would need a GPU for good-quality image display. The optimal screen resolution for a game depends on various factors such as the genre of the game, its graphical fidelity, etc. GPU scaling corrects any disparities in the aspect ratio (image’s width: image height) of the game and your monitor resolution. AMD GPU scaling makes it possible to scale the images both horizontally and vertically, without losing their resolution. With this option, you can easily fit older video games of 4:3 or 5:4 aspect ratio on your brand new 16:9 screen, without stretching the picture or pixelating it. If a specific image resolution is not compatible with your motherboard, GPU scaling can be used to adjust it. It creates clear on-screen images, thereby improving the quality of your videos and games. GPU scaling also makes it easy for you to play older versions of games that require 5:4 or 4:3 aspect ratios. In short, if you want a flawless gaming experience, GPU scaling is your best bet. If your image is smaller than the screen resolution, stretching to full size may cause pixelation. To avoid this, scale your images in this mode. This option places the image in the center of the screen in its actual size, and place a background around it. This option stretches the image to fit the entire screen. This may damage the picture quality as the image’s original aspect ratio is not maintained. This adjusts the image size to fit the screen without changing the image aspect ratio. A background pattern fills the rest of the screen. A separate window appears. In this window, select ‘Display’ settings from the menu bar. From among the options displayed, select “GPU Scaling” and turn it on or off. Select ‘Scaling Mode’ and from the drop-down menu, select the mode you desire (one of the three modes mentioned above). That brings us to the end of this article on the application of GPU scaling and the methods to turn it on/off. Please note that the GPU Scaling feature needs a digital connection between the display unit and the graphics adapter. We hope that we this article proves useful to you in your attempts to obtain a seamless and high-quality gaming experience!